Automatic Garage Solutions are a 100% Australian owned and operated company trusted by families all over Sydney. With a clear focus on customer service and reliability, we offer on the spot service, repair and installation of all major brands of garage door openers and remote controls. Our service technicians and highly trained, experienced and professional tradesmen with the knowledge to tackle any type of garage door problem. Installation and service of all major brands, expert advice from a trained professional, fully guaranteed service and products. We’re ready to help you in any way possible. Here at Automatic Garage Solutions we can proudly say that we are 100% Australian owned and the most trusted company operating in Sydney. Families have been using our superb services for many years, check the testimonials on this website for our excellent reputation. Our customer service is second to none for on the spot garage door repairs, service and installations for all the major brands. We offer full installation of garage door openers and remote controls in these areas of Sydney; North Shore, Greater West, Inner West, Hills District, St George, Sutherland Shire, Campelltown and Camden. We are the number one choice for automatic garage door repairs Sydney and the surrounding areas. Our highly trained service technicians are professional installers and have sufficient knowledge to endeavour to repair your garage door or install a replacement. We offer expert advice all along the way; from the moment you give us a call to when our technician arrives at your property. All of our services and products are fully guaranteed for your peace of mind. Our maintenance and garage door repair service is highly recommended by satisfied customers through the years. We advise you to keep your garage door regularly maintained, serviced for optimum performance and reliability. A garage door has moving parts that need to be checked and serviced, they cannot be just left for years and hope to work as they were first installed. The same applies to roller garage doors that have moving parts and electrical circuits that need to checked, you don’t want a roller garage door to become stuck and precious valuables on show for too long! We advise that a roller garage door needs to be serviced at least every 12 months. The roller door needs to lubricated, cleaned and well maintained to ensure a smooth operation every time it opens and closes. We specialize in repairing and maintaining roller doors, sectional doors, tilting doors, panelled doors and most other major types of garage doors. At all times we have an extensive range of new and used parts to repair garage door openers, motors and all of the major brands. By having these spare parts in stock we can usually repair roller doors Sydney and repair garage doors on the spot without having to come back and visit again. It makes sense to keep your garage door well maintained to avoid extra costs in servicing or repairing them. Here at Automatic Garage Solutions we can resolve any issues you have in and around Sydney and the surrounding area. We are experts at servicing fixtures, fittings, horizontal and vertical tracks, adjusting and lubricating hinges, bearings, chains, wheels, springs and tracks. If your motor receiver fails we can repair that for you, assess and replace a motor if necessary too. Our engineers carry spare light bulbs at all times and we can repair or replace cables and springs at your home. We are an authorised Merlin representative who you can trust to repair motorized Sydney garage doors. The first thing we do when you contact us is to assess the situation and see what the best solution will be. Depending on which type of garage roller you have or whether it has single or double spacing and the age of the garage door itself, we will choose the best replacement motor for you. At the same time as assessing your garage roller we will see which the ideal requirement is for the garage door opener and advise you appropriately. We will carry out an initial inspection and advise you whether the motor needs to be completely replaced or can be repaired. You will be glad to hear that we will only recommend a replacement if necessary and all new products come with a full manufacturer warranty. 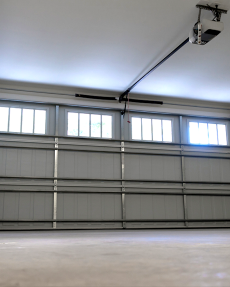 There are a variety of problems that can occur with garage doors that can include, roller doors ballooning and jamming, being stuck in open or closed positions. The emergency release can get stuck, doors do not always open automatically, just manually and these will need attention. The lock and key sometimes gets damaged and need replacing, this is something that can be easily resolved. Doors can be heavy to lift, they can also drop and not stay in position, remote controls can malfunction and will need to be accessed for the problem. The motor can carry on running, but the door not working and the roller door can become noisy with a squeaking sound. Other common problems include broken springs, wheels bent and hinges can break, all of these issues can be resolved by our service technicians. Our technicians can clean vertical tracks and lubricate, re-align, plus clean and lubricate the nylon felt around all four sides. The internal springs can be lubricated, adjusted and re-tensioned at your property to provide a perfect service package for you. We don’t just stop there with the roller doors, our technicians will clean and lubricate the brushes, replace weather strips and reprogram the motor to ensure a smooth operation. We carry out full checks and services on tilt doors to adjust, re-tension and lubricate the springs. All the nuts and bolts are inspected and then tensioned, the top frame angle can be strengthened if necessary and the motor will be adjusted, re-programmed, plus the open and close limits will be checked. When we check and service the sectional door, the first thing we look at is adjusting, re-lubricating and re-tensioning the springs. The nuts and bolts will be checked and will be tensioned, the top brace angle strengthened. Other areas that we cover everything include re-program the motor, adjust the open and close limits, plus force adjustment. The wheels bearings will be cleaned, adjusted and lubricated, plus the weather strip being replaced. Manual opening garage doors can be a problem to open sometimes and also highly inconvenient for many. A practical solution will be an automatic garage door that it is convenient and highly desirable. We can fit a brand new automatic roller system that will add to your home’s security and a whole lot more convenient for when you arrive home after a long day. 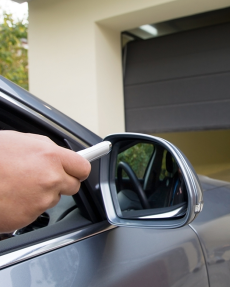 The best aspect of having an automatic garage door is that you don’t have to leave your car to open the garage door! We install garage door openers from Merlin that have the latest technologies and have superior reliability. The advantages of having an automatic garage door include that your car will no longer be exposed to prolonged exposure to rain and leaving the children in the car longer on their own. Garage doors can be heavy to lift if you have an injury, elderly or a child, prolonged opening manual garage doors could lead to an injury. We offer threes solutions to either motorise a door roller, motorise a sectional or panel door and motorise a tilt door. An automatic garage door would not be complete without a remote control device and these are all supplied from the excellent Merlin range. It is possible to have your garage door and front gate programmed onto the same remote control device. You can have a total of four items on one remote control device, so you could just use the one for everything that needs to be operated. As well as the Merlin door openers will have all the companies’ accessories too, wireless wall buttons, remote controls and even upgrade kits for obsolete remote control units. The remote controls come as the key ring type complete with pin code access for added security. Other desirable options include long range antennas, standby power units and these accessories can extend the life on your automatic garage door. We can manage your existing remote control devices for your garage and gate to be upgraded or replaced to the latest style without changing the motors. If you have any questions, then please give us a call and we can tailor a perfect solution for you. Some of the common problems with remote controls include a faulty battery, buttons that become faulty, corrosion and water damage, interference with the signal, damaged crystals after being dropped, plus the range or frequency being reduced. So don’t delay and give us a call for a free no obligation quote on 02 9793 3329, we are open from 8am to 5pm Monday to Saturday. You can also send us an enquiry via message on the website, we will respond to you promptly.